I’m honored to have been nominated for the Reality Blogger Award by my blogger friend Staci Trolio. Staci writes an extraordinary blog about writing. She inspires me with every post. To accept this award, I’m supposed to answer the following questions (in lieu of the acceptance speech Staci thought might be required) and nominate twenty other bloggers. Did it really say twenty bloggers? Stay tuned to the end for that portion of my acceptance. The cold weather in my newly adopted home in Pittsburgh. Like most people, it would be fun to be twenty-one again (for a day or a week), except this time around I’d have all the knowledge, wisdom, and tenacity I’ve acquired in the three decades since I was that age. I’d kick some serious dirt, no doubt. When my husband tailgates on the highway. I’ve not yet become a bestselling author, but every day I continue and persevere brings me one step closer. I know I keep learning and improving as a writer. That’s the easy part of this career path I’ve chosen. I believe on my best days that all the work, the tears, the highs, the lows, the laughter, the praise, the criticisms I’ve endured during the thirteen years I’ve called myself a writer will bring my dream to fruition. When I get down, I remember that I’ve achieved almost every big dream I’ve ever had, except for this one. Let’s see what the next decade brings. That’s a tough question. I’m perfectly content where I am right now. Anytime in my life when I’ve wished to have someone else’s life, I’ve always discovered one cliche to be false. The grass is never greener on the other side. I said I’d get back to the twenty bloggers thing. I decided to do what Staci did. I’m going to nominate five bloggers who I believe exemplify writing posts that qualify for their honesty and bravery in writing about tough issues. All of them are fellow writers who produce some excellent work through their blogs. Please check them out and don’t forget to go to Staci’s blog. She’s from my newly adopted home of Pittsburgh, but she’s relocated away from her home her in the Steel City. I hope she comes home one day so we can meet in person. I don’t usually post on Sundays, but I wanted to share this series of articles from the Beaver County Times. Saturday’s story explores “brine” or wastewater disposal. Sunday’s piece (not yet posted online) profiles a driver of one of the trucks hauling away the wastewater. 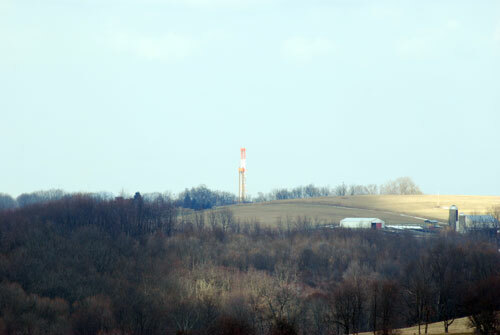 The disposal of what comes out of the ground is another layer in the controversy over fracking. The U.S. Geological Survey released a study recently linking fracking wastewater disposal in deep wells to recent earthquakes in the United States near these wells. Another website EcoWatch also presents information on this subject. To be fair, I checked the Marcellus Shale Coalition website and put in “fracking wastewater.” Here’s what came up: http://marcelluscoalition.org/2012/11/what-theyre-saying-natural-gas-creating-significant-environmental-benefits-sparking-a-manufacturing-renaissance/. My searches haven’t turned up anything else in response to this. Please let me know if there’s another side to this issue. I’m a journalist, and I want to be fair. I also live atop the Marcellus Shale and want solid unbiased answers. I recently went to see the new movie Promised Land starring Matt Damon, as rising star salesman Steve Butler. What does Steve sell? The promised glory to landowners if only they’ll sell off the rights to their land so the power companies can drill for natural gas on their property. Steve makes up figures and tosses out promises so some desperate landowners in western Pennsylvania are convinced they’ll become millionaires, if only they’ll allow the drilling. He doesn’t go into detail about the process, which is called fracking. Fracking allows drillers to go deep into the earth to extract natural gas. Recently, in states sitting on the rich resource, some homeowners have water so contaminated with chemicals they ignite. The article leads with this paragraph: WEATHERFORD, Texas (AP) — When a man in a Fort Worth suburb reported his family’s drinking water had begun “bubbling” like champagne, the federal government sounded an alarm: An oil company may have tainted their wells while drilling for natural gas. But then the EPA changed its mind and decided to leave the company alone. The movie Promised Land has been vilified by the natural gas industry for painting an unfair portrait of fracking. The Marcellus Shale Coalition even purchased ads to run before the movie. When we saw the movie, the ad played about ten minutes before the show so when the movie started, the ad was forgotten and not seen by the twenty or so folks who came in afterwards. The industry says the process of fracking is safe. Scientists, environmentalists, and some who live close to the drilling sites say differently. It’s a dilemma, and one faced by Steve Butler in the movie once he begins to see his victims as real human beings he’s lying to. The fact is he doesn’t really know anything about the science behind the drilling. He’s just in their homes to sell a pipe dream. It’s a complicated issue, and it needs much more study before we go any further. Even the Sierra Club first endorsed the process because they felt natural gas was the solution to ridding the world of “dirty coal.” But not anymore. Now they put fracking in the same category as coal mining. The Promised Land is a work of fiction with a particular viewpoint that explores the dilemma of bringing natural gas up out of the ground fast and cheap. I’ve heard criticisms of the ending, but I’m not sure I understand why. I won’t give it away here because I’d like you to go see the movie and make up your own mind. It’s important to remember the movie is a fictional account of one man’s struggle between his job and his moral integrity. It’s up to him to decide if the two are mutually exclusive. And guess what? It ends the way the writer decided to end it. Period. 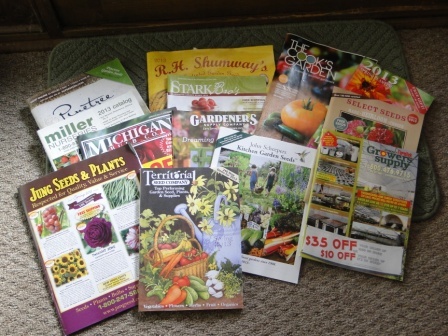 The seed catalogs appear in the mailbox daily now. Today we ordered seeds for broccoli, brussel sprouts, radishes (both red and the long white variety), lettuce, Swiss chard, parsley, basil, and flowers. However, the catalogs came a little late for onions. After consultation with Llewellyn’s 2013 Moon Sign Book, my husband determined the best time to start the seeds was in the waning days of 2012. 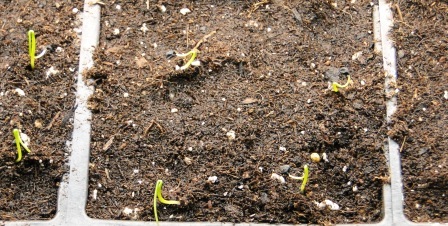 So while we were in Florida over Christmas, my husband began sprouting onion seeds. He buys the cheapest and thinnest paper towels and places a layer of seeds on one sheet. Then he piles sheet upon sheet until the top of the plastic container is full. He dampens the towels with water and keeps the container in a warm place. He treated his package as if it was a pet, carrying it inside wherever we visited and adding water as necessary to keep the towels damp. 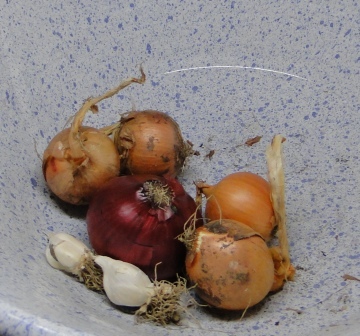 This year he sprouted seven varieties of onions – both short and long day types – of yellow, white, and red. By the time we arrived back in Pennsylvania, the seeds had sprouted in their paper towel womb. 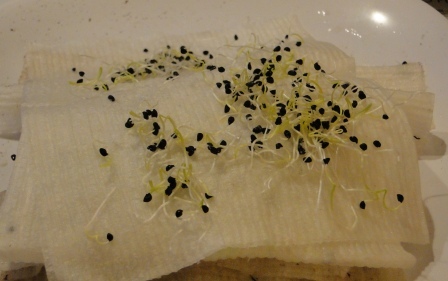 The thin paper towel helps those tiny little sprouts from sticking to the layers. 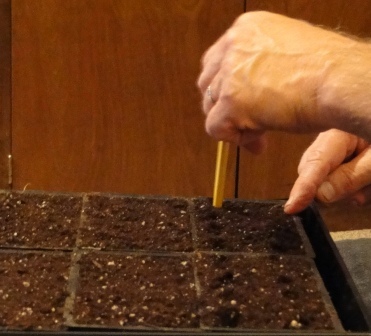 A week ago, he put the seedlings into four-pack containers filled with regular potting soil with a very small quantity of organic and rock fertilizers. He uses a five-gallon bucket for soil (two-thirds filled) and throws in a handful of the fertilizers. Once the packs are filled with dirt, he pokes holes in each section with a pencil. Then he “pokes” the onion seedlings into the soil. Now the seedlings are growing happily under grow lights in cupboards in our family room. Unfortunately, we don’t have a heated greenhouse, but we’ve found a way to manage. Now we await the shipment of the rest of the seeds. Some seeds, such as tomatoes, peppers, and butternut squash, he’s kept from last year’s crop. But he’ll still get some new seeds, even though each year I tell him more than twenty healthy tomato plants are way too much for two people unless I set up a roadside stand. How about you? 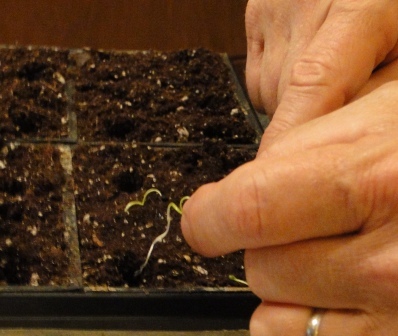 Are you sprouting seeds, looking at catalogs, waiting for the nurseries to open with plants, or anticipating the local farmer’s market in your area? Whatever you do, locally grown food is always the best choice. Note: We recycle the magazines when we’re done with them each year. We also reuse all the four- and six-pack containers as well as the trays. I’m on hiatus right now while I recover from a virus. This is an interesting post from one of my favorite bloggers. Enjoy. and that is why I’m posting Chayote as the new food for New Food Friday. Chayote, pronounced Cha-i-O-tee, is a fruit that is used like a vegetable. It is originally native to Mexico or Central America. It is a very pretty pale green and the easiest produce I have ever peeled, fruit or vegetable! My paring knife just glides and therefore it is a pleasure to prepare. Happy 2013. We made it past the end of the Mayan calendar, but not sure if we fell off a cliff or not. 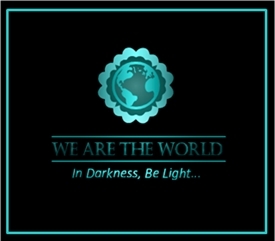 I wish for you all peace and prosperity this coming year and may you all discover purpose in your life. 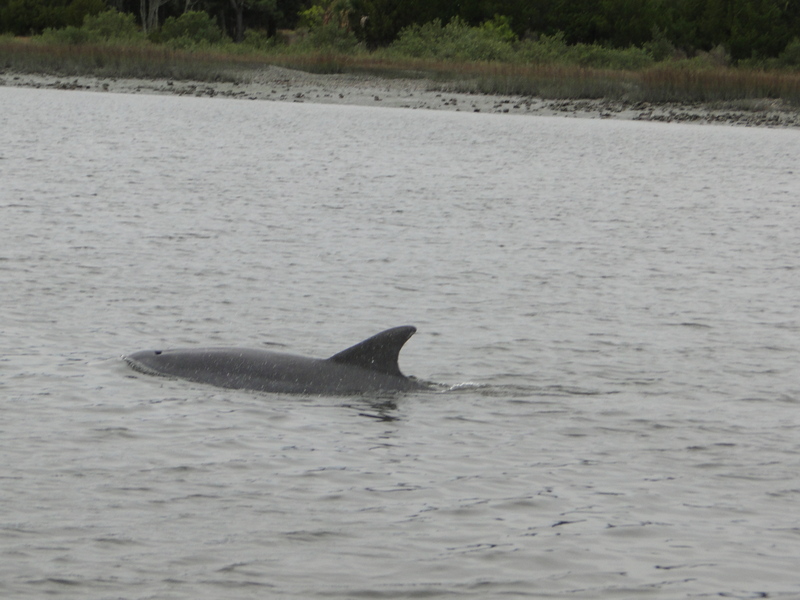 If that’s not possible, I hope you at least dance as free as the porpoises I saw on Christmas Eve swimming in the San Sebastian River in St. Augustine.